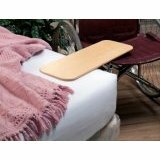 Firm 4” foam cushion provides lift and comfort while a hardboard insert provides extra support to eliminate hammock effect when used in wheelchairs. Cover made of durable black leatherette with 5” strap handles. 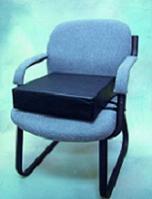 Can be used in wheelchairs, conventional chairs or anywhere additional height is needed. Size: 16" x 16" x 4".